Season seven of Fortnite only has around a month left before it comes to a close. As such, the Fortnite week seven challenges are here to help you earn a ton of battle stars and get you as close as possible to that coveted tier 100. Like usual, there are a total of seven challenges to take on as this wintery season continues. Oddly enough, the week seven challenges are much easier than we expected. In fact, the biggest one that we have this week is very similar to a certain challenge from a few weeks back. But, it is slightly different than before so, without further ado, let’s dive right in and get started. There’s a total of seven challenges to tackle this week in Battle Royale. These will probably be the easiest yet as the challenges this week resemble those we’ve tackled in the past. If you’re interested in checking all the current week seven challenges out, simply head over to the coinciding tab from Battle Royale lobby or check the screenshot above! 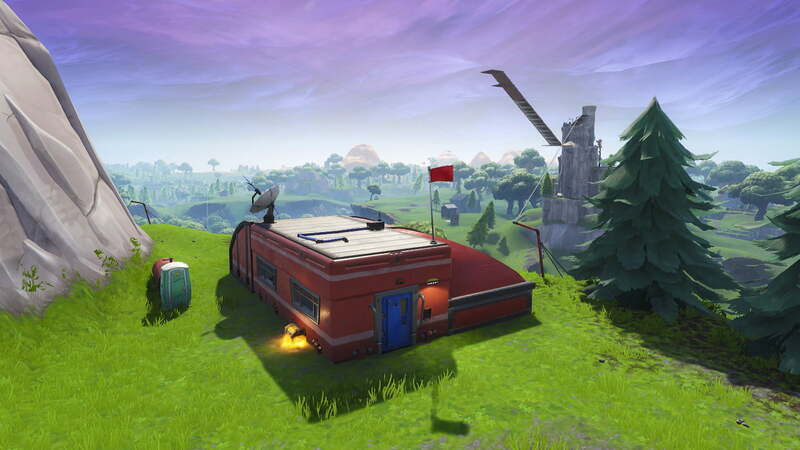 The challenge that stands out the most this week is finding all of the Fortnite expedition outposts. There are seven in total that we will need to find and visit on the Battle Royale map. It’s a pretty straight forward challenge, one that has us searching for something specific once again like we’ve been doing for the last couple of weeks. If you’ve been participating in the weekly challenges this season, you will likely recognize this challenge. A few weeks ago, there was a similar challenge that had players kill enemies at the expedition outposts. Thankfully, that extra step isn’t required this time around. All you need to do is visit all seven of the outposts on the map and you’re good to go. Unfortunately, unlike the hidden battle star challenge from a couple of weeks ago, this one will require you to travel all over the map. In fact, none of the expedition outposts are even remotely close to one another and are evenly spread apart. Thankfully, there is a solution to this. We recommend that you grab a stormwing as soon as you see one and use that to jet around the map. Additionally, you don’t have to stick around to the end of each match you’re in. You can simply visit as many outposts as you can, then leave and start a new match. We recommend that you do this week seven challenge in the Team Rumble mode or whichever big team mode is available right now. Team Rumble gives you less enemies to worry about, more teammates to watch your back, and 10 minutes before the storm closes in. Since the expedition outposts are spread out on the Battle Royale map, you can honestly visit these in any order you’d like. This is especially the case if you happen to find a stormwing plane to fly around on. However, we are going to go in the order that we went in, which is sort of like a counter-clockwise circle around the entire map. There are only seven expedition outposts on the whole map and you will, unfortunately, need to visit all of them. 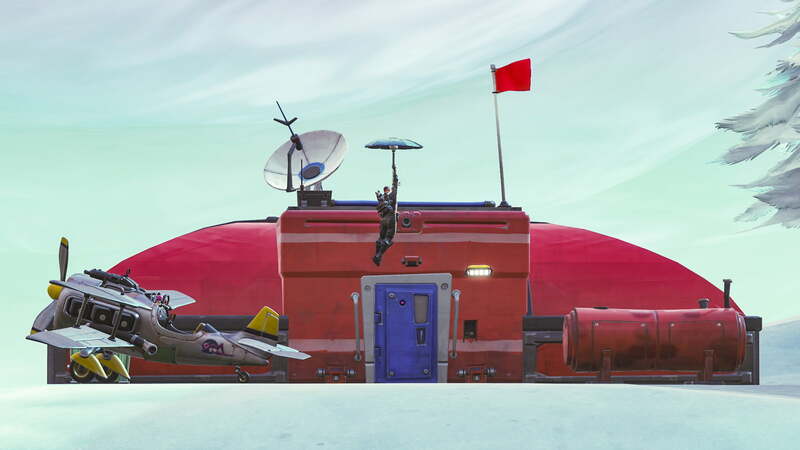 When you are coming in on the Battle Bus, what you will want to do is land directly on your first outpost. The first one that we recommend is west of Paradise Palms. The actual outposts are really easy to spot once you get close because you can see the red mark on the map. The exact coordinates of this particular expedition outpost is in the H8 square on the grid. It is just to the west of the hills by Paradise Palms and east of the grassy border. Since you don’t have to kill enemies here, all you need to do is walk up close to it. The tricky thing is that we’ve noticed that the notifications for each step of the challenge you complete aren’t showing up like they should right now. If this happens to you, too, just open up the menu real quick and check to see if it picked up whether you visited the outpost. Once you’re good to go, grab any equipment from the chests inside and jump in a stormwing nearby if there are any left. Next up is the outpost that is pretty far to the northeast. 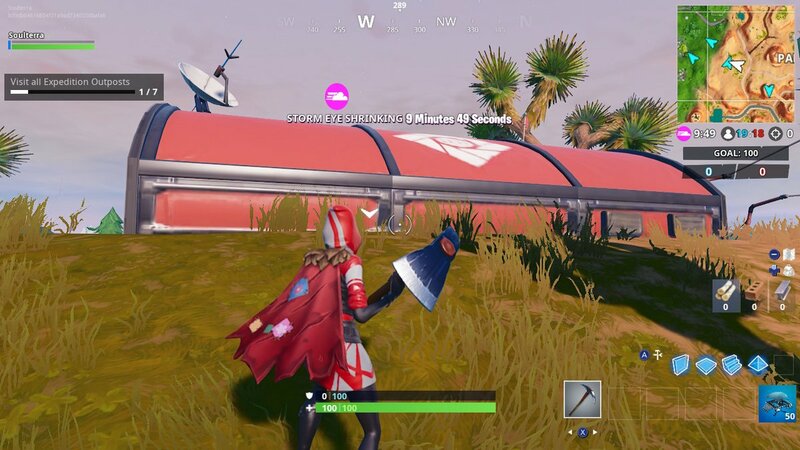 We are heading from Paradise Palms all the way up to Lonely Lodge. If you didn’t find a stormwing at the previous location, that’s fine. We weren’t able to get one in time either but we found plenty at this next spot. 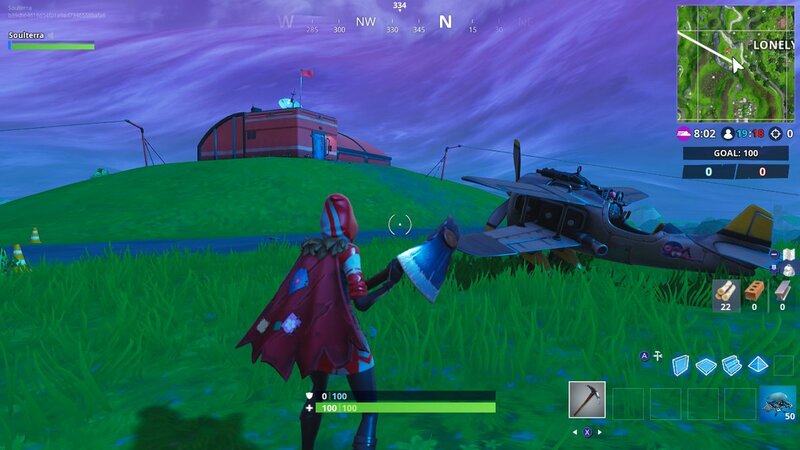 Its exact location is just to the west of Lonely Lodge on the big hill that’s right next to the named location. It is found in the I5 square on the grid map. It is a little high up so if you don’t have a stormwing plane yet like us, then you’ll probably have to chop down a few of the big trees real quick so you can build yourself a ramp up here. Walk up to the outpost, make sure it registers the completion, and then it’s time to move on. Next up is the third expedition outpost that can be found in the very center of the map. We are going to head to Dusty Divot, specifically the mountain to the west of it. If you’ve got a stormwing, this will be a pretty simple task. All you need to do is either hop out of the plane at the right moment or take your time and brake it for a nice, smooth landing. Regardless, the exact spot that we are going to is right on the edge of F5 and F6. We aren’t going to the top of the mountain actually but the little middle part on the south side. If you don’t have a plane yet, you’ll need to build even more ramps to get up. The next location is just to the north of the last one. 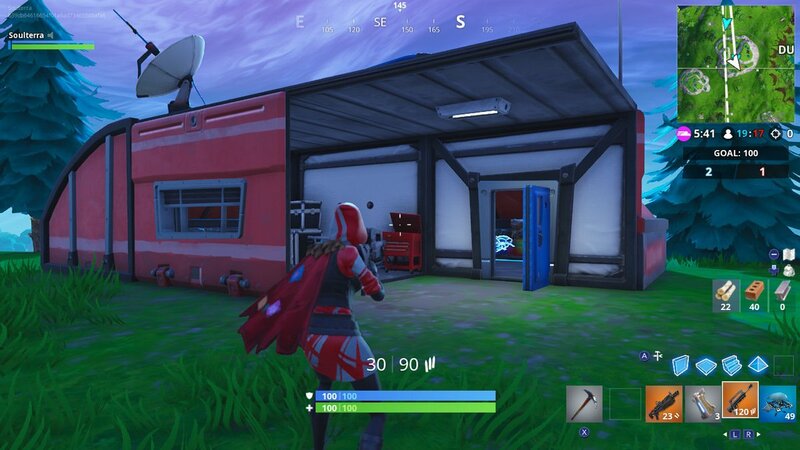 It is right in between Lazy Links and Tomato Temple. It’s to the southeast of Lazy Links and northwest of Tomato Temple. Its exact location on the Battle Royale grid is in the F3 square. It is on a little hill but you can easily walk up this one without worrying about building ramps or anything like that. If you still don’t have a stormwing plane just yet, this is the perfect place to get one. We saw more than three here when we arrived so be sure to grab one in order to make the last three outposts much easier to do. The next one is just to the west of your current location. 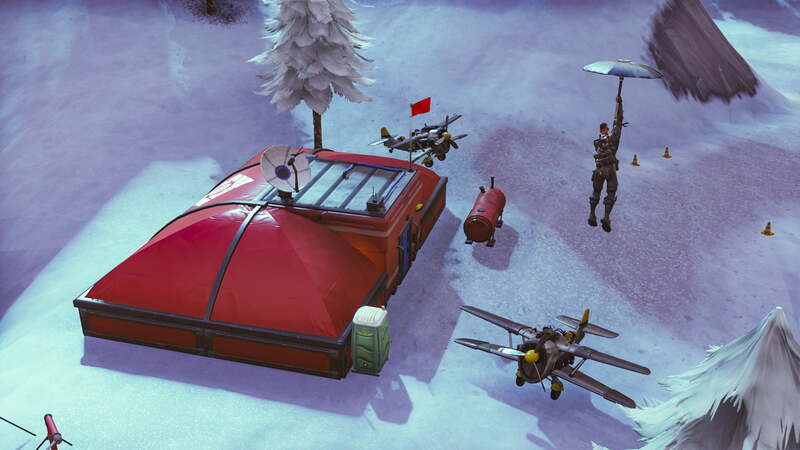 The fifth outpost can be found on a large mountain that is right next to Pleasant Park, northeast of it. The exact location for this outpost is in the D3 square on the Battle Royale grid map. The outpost itself is found on the south side of this mountain. Visit it and you’re good to go. Oddly enough, these two outposts are the only ones that are sort of close to one another. 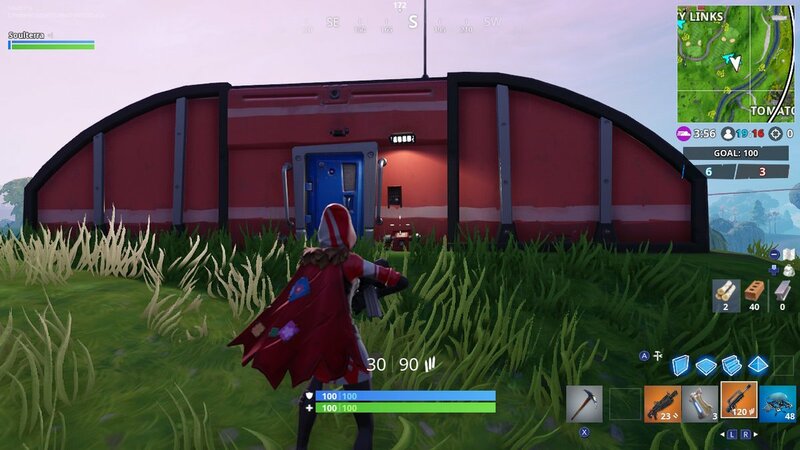 But, this one is found on the opposite side of Pleasant Park. 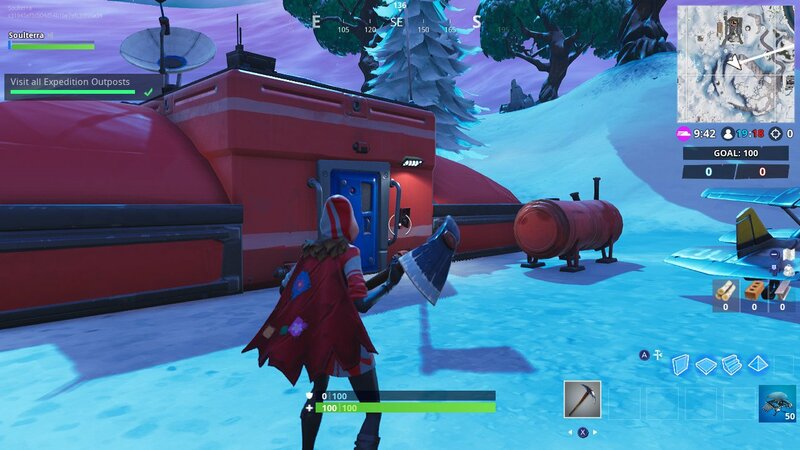 We will need to head southwest of Pleasant Park to find this outpost. It is also northwest of Tilted Towers and slightly northeast of Snobby Shores. Its exact location is found on the border between the B5 and C5 squares on the map grid. It is also smack dab in between the two large mountains that are found right here. There is a little valley here where you can find this sixth expedition outpost. Visit it and there is only one more left to find. For us, we were only able to get six of the seven expedition outposts in one match by using the stormwing plane. Thankfully, you can leave a match whenever you want and the challenges will still count. So, don’t worry if you need to leave a match to grab the last couple of outposts. This final one is far to the south, found just to the northeast of Happy Hamlet. 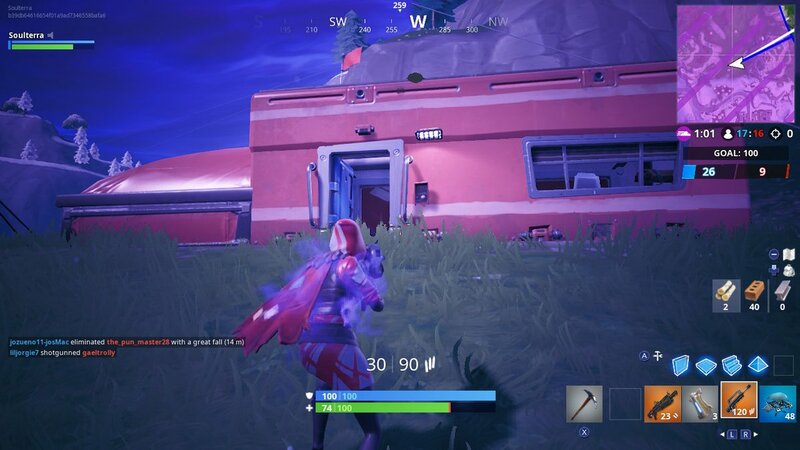 If you can, use your stormwing or land from the Battle Bus on top of this final outpost. It is on top of a mountain on the southern tip of the D8 square on the map. If you’re running here, you will need to do a bit of building to get up there. Visit it and you’ll have completed this challenge. The reward for visiting all seven of the outposts on the Battle Royale map is five battle stars. While not a whole lot, this is a relatively easy challenge to do with a stormwing plane. The five stars are enough to guarantee half of a tier level up.